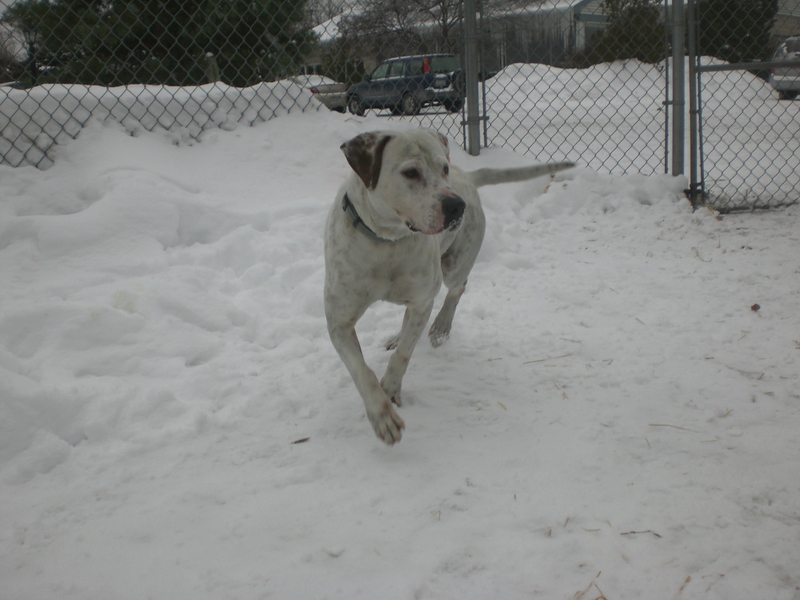 One-year-old dogs are still puppies in my book, and Orphans of the Storm® currently has plenty of pups to choose from! Josie the one-year-old Basset Hound mix is very lovable. Everyone knows by now that I’m a softy when it comes to dogs who want belly rubs, and Josie absolutely loves them. 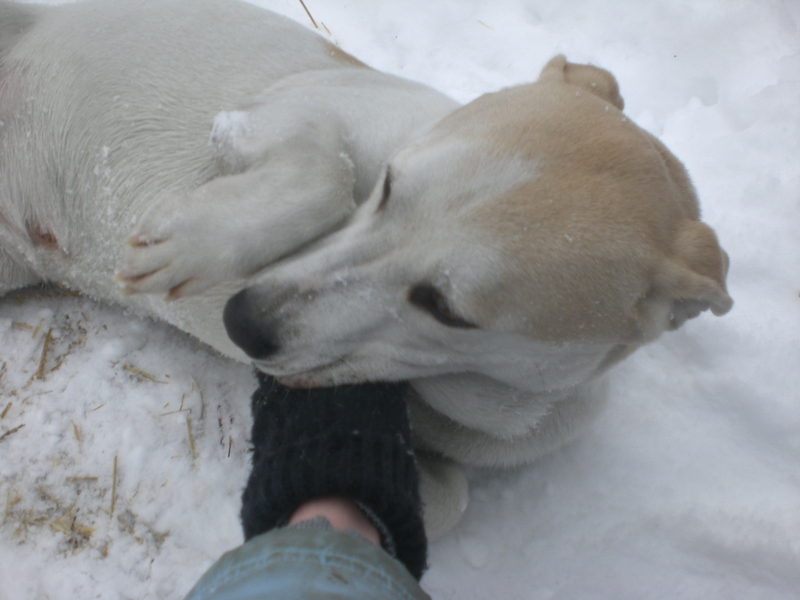 She didn’t care about the ice or the snow–she just flipped right over and gave me a big doggy grin while I rubbed her tummy. And she has just the cutest face! 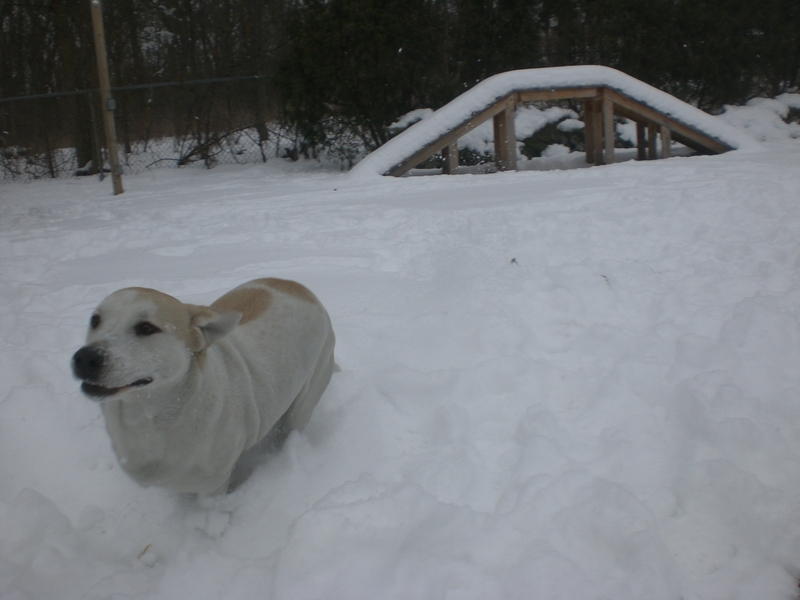 The snow may have been deeper than Josie is tall, but Josie didn’t mind! Josie was originally sharing her kennel with another dog who recently got adopted, so she is both dog-friendly and people-friendly. However, Josie would do best in a single-person home because she gets very attached to her person. And what’s wrong with having a loyal companion? Nothing! Josie was also a good walking companion who would enjoy a good walk around the neighborhood with her new owner. Come in soon to meet Josie! Nicki the one-year-old Pit Bull Terrier mix has pretty good manners for such a young dog. When I came up to her kennel with the leash, instead of jumping up and down like a lot of the dogs do, she laid down and waited patiently for the leash to be put on. Since she’s still young, she could probably use some training–but she certainly seems eager to please! Nicki has plenty of puppy energy, of course. She had a great time racing Diamond along the fence between the runs, and Diamond got tired long before Nicki did. 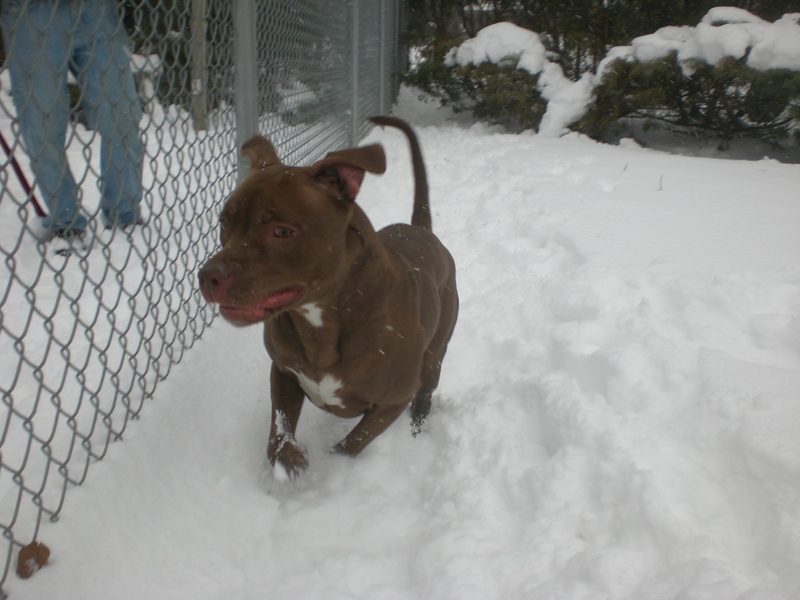 Nicki has also become a quick favorite of the other volunteers at the shelter, since she’s such a sweetie. Don’t let Nicki spend too much longer at the shelter–she deserves a home to call her own! Nicki takes the lead in her race with Diamond! Hutch the one-year-old Labrador Retriever mix was a little shy when he first came out of his kennel (he seemed more interested in standing between my feet rather than walking with me), but he warmed up quickly. 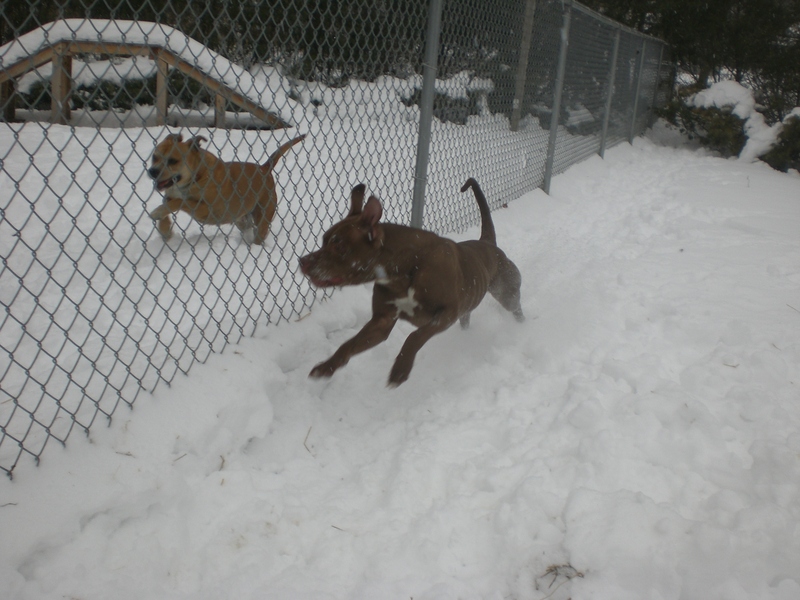 And he certainly didn’t mind the snow–in fact, he wanted to jump right into the deepest pile! He looked a little disappointed when I didn’t follow. Hutch is just the cutest. I love his spots, his ears, his face–everything! Hutch was also politely interested in Corky on the other side of the fence, but was more interested in sticking his nose into the snow and finding a fun scent trail to follow. Hutch enjoyed a good scratch on the back and was a pretty good leash-walker. Stop by the shelter soon to say hello to Hutch! 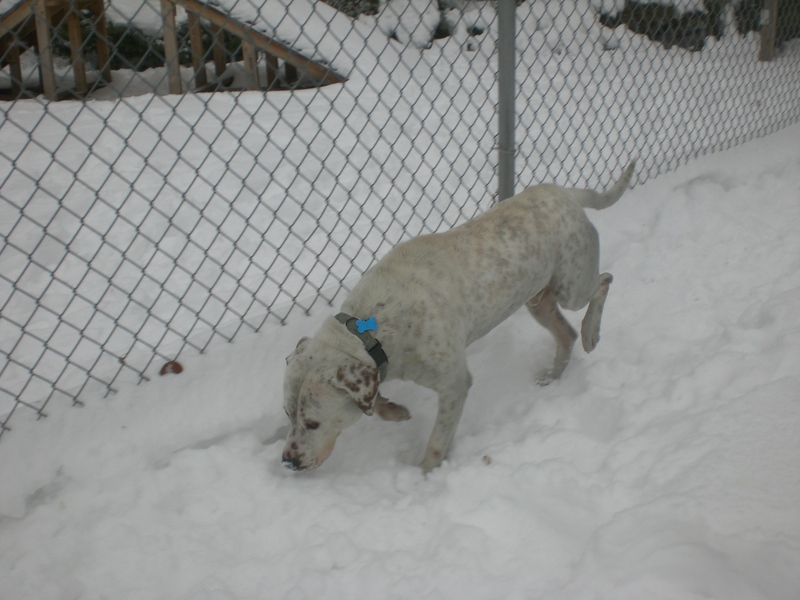 Some other dogs who enjoyed the snow on this chilly day were Wilbur, Rosco, Jade, Ebbie, Keini, Molly, and Trixie (who loves to catch and eat snowballs in place of her favorite tennis balls). Posted by Meet the Pooches on January 9, 2014 in Dog Profiles and tagged adopt, adoption, animal shelter, animals, Basset Hound, Chicago, dogs, Labrador Retriever, Orphans of the Storm, pets, Pit Bull Terrier, puppies.